We set out for Bangkok, Thailand late on Jan. 17th, 2014. We decided to take a layover in Dubai so Ittybot could get a chance to let off some energy. We flew Emirates for both legs and we were very impressed by their service! We were given the coveted seats right behind the bathroom/kitchen (where there is extra leg room). So Ittybot was able to stand or sit on the ground when he just had enough of us. They also provided a bassinet for him to sleep in. He just barely fit in there – which made me a little sad. As an added bonus, they gave Ittybot some goodies! He was given a blanket w/ a monster teddy attached and a baby care bag which included: wipes, lotion, spoon, bib, and a disposable bag to toss out his diaper. We were so impressed we will definitely try to fly with them again. Highly, highly recommend them! As I’m sure many of you have heard, there are some ongoing protests in Bangkok. Unfortunately, we already paid for all the (non-refundable) hotels so we decided to go anyways and hope for the best. We also have a friend who lives in Bangkok who has been keeping an eye on the situation and gave us status updates. Luckily, the protests have remained peaceful and had little impact on the first leg of our trip. Thankfully, Ongsa came to pick us up at the airport so we wouldn’t be scammed. It’s been years since we’ve seen him and it would be the first time that I got to meet his little girl. It’s so dang cute to hear her speak Thai. Sassy girl loooves Ittybot and she has her parents wrapped around her cute little fingers. Of course, I tried to squeeze in as much shopping as I possibly could. The protests did block some roads but we scurried through the crowd to the MBK mall. MBK mall is basically a mall with small vendors like a street market. Targets: tourists. I pretended to not understand Thai so I could listen in on the insults. Of course, we were charged the tourist prices and when we tried to negotiate, the ladies would complain in Thai. There were even some insults! I wish I would’ve responded in Thai, but I just couldn’t think of a snarky response at the time. Siam Paragon was just outside our hotel. I was super excited to visit Siam Paragon because it’s supposed to be the “fancy” mall of Thailand. I was unimpressed. Although, their food court was AMAZING! Ongsa and his family took us on a dinner cruise on the Chao Praya River. The temples at night were absolutely stunning. One of my bucket list items was to visit a water market. As a little girl, there was a picture at my aunt’s house of a water market. The rivers were jammed with boats filled with exotic fruits. The day finally came where I got to visit. My dreams were shattered. There were maybe five boats pulled to the side. Ongsa explained that the days of jammed pack rivers have been long gone. They now pave way for speedboats carrying tourists. Boo. We decided to try the speedboat and took a private tour. It only costs us 500 baht for an hour long tour. Terminal 21 was another “must-do” for me. It did not disappoint. It’s a fairly new mall and each of the floors had a “city” theme such as: London, Tokyo, San Francisco Bridge/Pier, and Rome. Their attention to detail was impeccable. Even their bathrooms were themed! 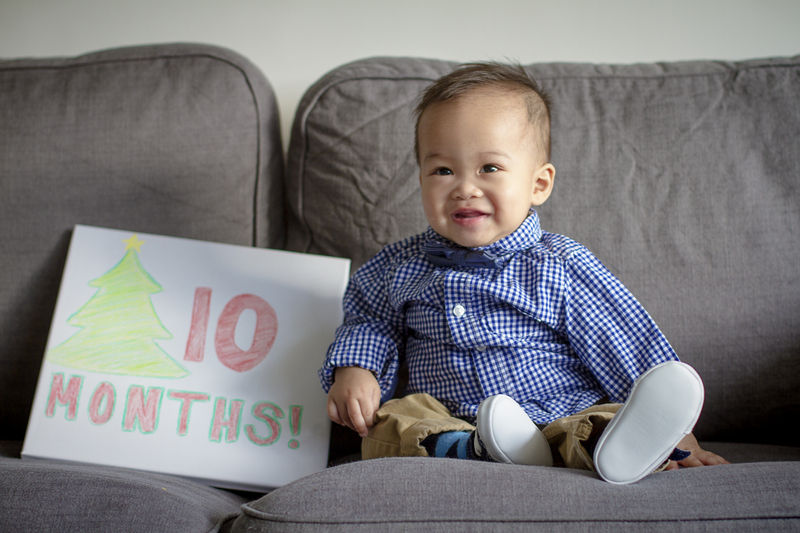 We have been so insanely busy the last few weeks that it completely slipped my mind…Ittybot’s 10 month picture! We have been busy running around Belgium and Paris (I know, poor me! ), then when we got back we got sick! And now, we are packing and prepping for Thailand – while still being under the weather. WHEW! What an insanely hectic month! But c’mon. It’s a great problem to have. How can I complain?! Without further ado, here is my big boy!